Thirty and forty years ago, we were keeping 75% or more of the alcoholics who came to us for help. Today, we aren’t keeping even 5%. What happened? 07/22/2004 – What happened? That question is being asked by a lot of alcoholics lately. What happened to our high success rate? Thirty and forty years ago, we were keeping 75% or more of the alcoholics who came to us for help. Today, we aren’t keeping even 5%. What happened? What happened to that wonderful A.A. Group that was around for 20, 30 or 40 years? There used to be 50, 75, 100 or more at every meeting. It is now a matter of history, gone! With so very few finding lasting sobriety and the continued demise of AA groups, it is obvious that we have not remained willing to admit our faults and to correct them promptly. It appears to me that the Delegate of the Northeast Ohio Area, Bob Bacon, identified our mistakes and our faults when he talked to a group of AA’s in 1976. He said, in essence, we are no longer showing the newcomer that we have a solution for alcoholism. We are not telling them about the Big Book and how very important that Book is to our long term sobriety. We are not telling them about our Traditions and how very important they are to the individual groups and to Alcoholics Anonymous as a whole. Rather, we are using our meeting time for drunk-a-logs, a discussion of our problems, ideas and opinions or “my day” or “my way.” Having been around for a few years, and reflecting on what Bob Bacon had to say, it would appear that we have permitted newcomers to convince the old-timers that they have a better idea. They had just spent 30 or more days in a treatment facility where they had been impressed with the need to talk about their problems in Group Therapy Sessions. They had been told that it didn’t make any difference what their real problem was; A.A. had the “best program.” They were told that they should go to an A. A. meeting every day for the first 90 days out of treatment. They were told that they shouldn’t make any major decisions for the first year of their sobriety. And what they were told goes on and on, most of which are contrary to the program of Alcoholics Anonymous! 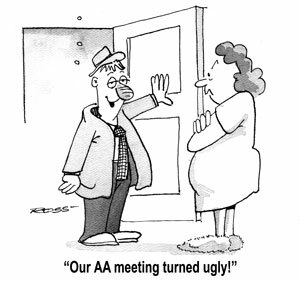 When A.A. was very successful, the folks who did the talking in meetings were recovered alcoholics. The suffering and untreated alcoholics listened. After hearing what it takes to recover, the newcomer was faced with a decision; “Are you going to take the Steps and recover or are you going to get back out there and finish the job?” If they said they “were willing to go to any length,” they were given a sponsor, a Big Book and began the process of recovery by taking the Steps and experiencing the Promises that result from that course of action. This process kept the newcomer involved in working with others and continued the growth of our Fellowship. Our growth rate was approximately 7% per year and the number of sober members of Alcoholics Anonymous doubled every 10 years. With the advent of the rapid growth of the Treatment Industry, the acceptance of our success with alcoholics by the judicial system and endorsement of physicians, psychiatrists, psychologists, etc., all kinds of people were pouring into A.A. at a rate greater than we had ever dreamed possible. Almost without realizing what was happening, our meetings began changing from ones that focused on recovery from alcoholism to “discussion or participation” types of meetings that invited everyone to talk about whatever was on their mind. The meetings evolved from a program of spiritual development to the group therapy type of meeting where we heard more and more about “our problems” and less and less about the Program of Recovery in the Big Book and the preservation of our Fellowship by adhering to our Traditions. What has been the result of all this? Well, never have we had so many coming to us for help. But never have we had such a slow growth rate which has now started to decline. For the first time in our history, Alcoholics Anonymous is losing members faster than they are coming in and our success rate is unbelievably low. Statistics from the Intergroup Offices of some major cities indicate less than 5% of those expressing a desire to stop drinking is successful for more than one year; a far cry from the 75% reported by Bill W. in the Forward to the Second Edition. The change in the content of our meetings is proving to be misery-traps for the newcomer and in turn, misery-traps for the groups that depend on the “discussion or participation” type meetings. Why is this? The answer is very simple. When meetings were opened so that untreated alcoholics and non-alcoholics were given the opportunity to express their ideas, their opinions, air their problems and tell how they were told to do so where they came from, the confused newcomer became more confused with the diversity of information that was being presented. More and more they were encouraged to “just go to meetings and don’t drink” or worse yet, “go to 90 meetings in 90 days.” The newcomer no longer was told to take the Steps or get back out there and finish the job. In fact, they are often told, “Don’t rush into taking the Steps. Take your time.” The alcoholics who participated in the writing of the Big Book didn’t wait. They took the Steps in the first few days following their last drink. Thank God, there are those in our Fellowship, like Joe and Charlie, Wally, etc., who have recognized the problem and have started doing something about it. They are placing the focus back on the Big Book. There have always been a few groups that would not yield to the group therapy trend. Recovered alcoholics have begun founding groups that have a single purpose and inform the newcomer that until, they have taken the steps and recovered, they will not be permitted to say anything in meetings. They will listen to recovered alcoholics, they will take the Steps, they will recover, and then they will try to pass their experience and knowledge on to the ones who are seeking the kind of help we provide in Alcoholics Anonymous. As this movement spreads, as it is beginning to, Alcoholics Anonymous will again be very successful in doing the one thing God intended for us to do and that is to help the suffering alcoholic recover. If the newcomer has decided he or she wants what we have and is willing to go to any length to recover, we ask the newcomer to take and apply our Twelve Steps to his or her life and protect our Fellowship by honoring our Twelve Traditions. We have permitted untreated alcoholics and non-alcoholics to sit in our meetings and lay out their problems, ideas and opinions. We have gone from, “Rarely have we seen a person fail” to “Seldom do we see a person recover.” So there we have it. We have had 30 years of unbelievable success by following the directions in the Big Book. We have had 30 years of disappointing failure by wanting to hear from everyone. We now have something to compare. We now know what the problem is and we now know what the solution is. Unfortunately, we have not been prompt to correct the faults and mistakes, which have been created by what would appear to be large doses of apathy and complacency. The problem we are trying to live with is needlessly killing alcoholics. The Solution? The Power greater than ourselves, that we find through our Twelve Steps, promises recovery for those who are willing to follow the clear cut directions found in the Big Book.